On a very warm and sunny day in the city, I wheeled my camera gear from the garage across Walnut Street to the Annenberg. I made my way thru the crowd, stepped inside, and paused to soak up the a/c. In the main hall just beyond the show posters were tables, banners, and frenetic activity radiating out in all directions. This was my first time covering the event and I had been mentally trying to account for all manner of unforeseen circumstances. Now as I slipped deeper into the mass of anxious, smiling faces, it occurred to me me this was for experiencing and not to be ‘prepared for’. I ducked into one of the large side rooms where the kids were getting ready and thought things would settle down a bit. I could not have been more wrong! The T-VOCE group was bustling with energy. There was dancing here, singing around the piano there, and laughing at each other elsewhere while trying to work the T-VOCE shirts on over their clothes…. From a photography perspective, there was no shortage of moments to capture. Shortly before showtime we moved to a room just behind the stage. There were rows of long horizontal mirrors with lights above and benches below. 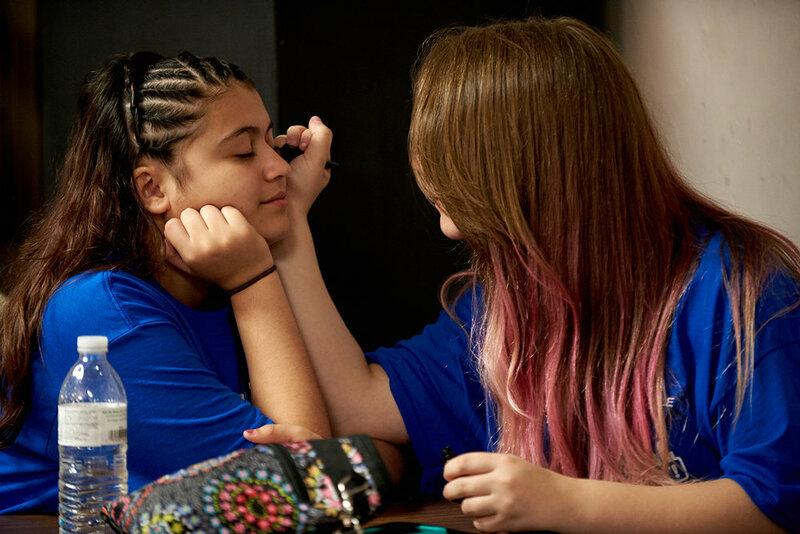 Some of the kids fixed make up and tweaked hair, others were taking selfies and laughing with nervous energy. The dancers were stretching, running thru elements of their routines, and checking on costumes. It was impossible not to be swept up in the energy. So, just what is T-VOCE? 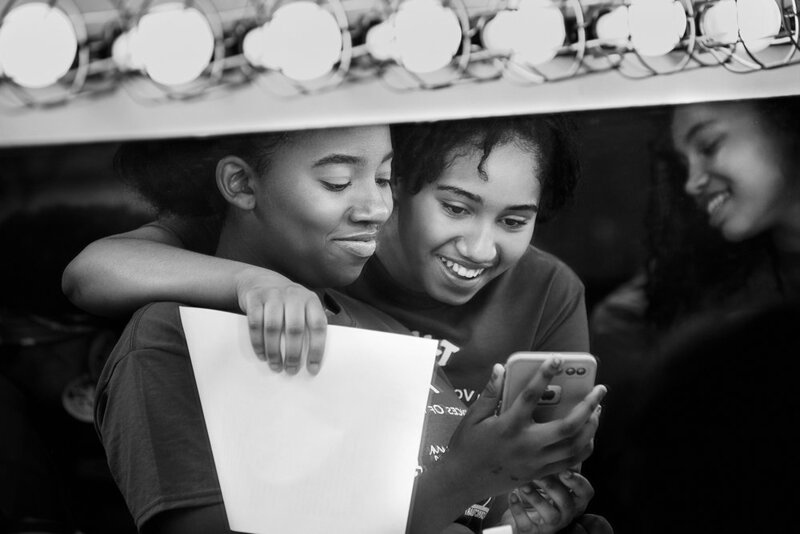 From the website: T-VOCE (tee-VO-chay), Teen Voices of the City Ensemble, is a free choir open to Philadelphia area teens. The program is a collaboration between Art Sanctuary, Opera Philadelphia, Play On, Philly!, and Singing City. ’T-VOCE’ comes from the Italian word "voce," meaning "voice”. The choir is about empowering and celebrating the voice of Philadelphia youth and their overwhelming talents. Everyone moved backstage and either steadied or psyched themselves up to perform. I slipped into the wings as the theatre went dark and the stage backdrop turned a vibrant blue. Valerie Gay of Art Sanctuary and Michael Bolton from Opera Philadelphia made the opening remarks and introductions. As the kids took the stage and began to sing, you could feel the joy. It was an exceptional way to spend an afternoon in our city. Read the full article on the Broad Street Review website. With some luck, and support, this program will hopefully flourish and grow. Many thanks to Michael Bolton, Valerie Gay, Veronica Chapman Smith, Emily Sung, Ting Ting Wong, and Steven Humes… Opera Philadelphia, Art Sanctuary Philadelphia, Singing City, Play On, Philly!, Esperanza Academy, Esperanza Dance Academy, Annenberg Center Live. All images, unless otherwise noted, are © Dave DiRentis.